Have you ever wanted to make a story but don't know how to start? Do you have pieces of a story (characters, setting, plot points) but don't have the whole picture? 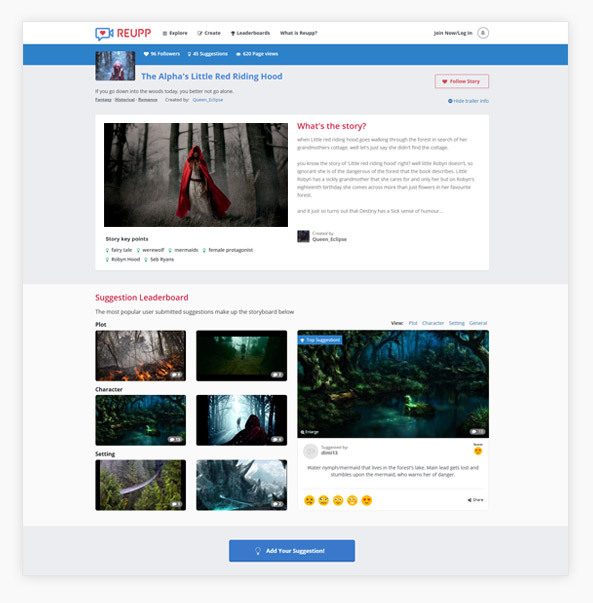 Create your story on Reupp and have our supportive, creative community help you piece together the next great tale! That's it! After submitting the basics of a new story, watch as your story takes off and captures the imagination of the Reupp community. Have fun! Reupp allowed me to be creative, and get support and ideas from a supportive community! Influence real TV shows and movies! Get exposure and ideas for your story!